Sharon and I had breakfast in the Church Street Marketplace during the second day of our F@ll 2017 trip through New England and then explored it again at lunch before heading east. 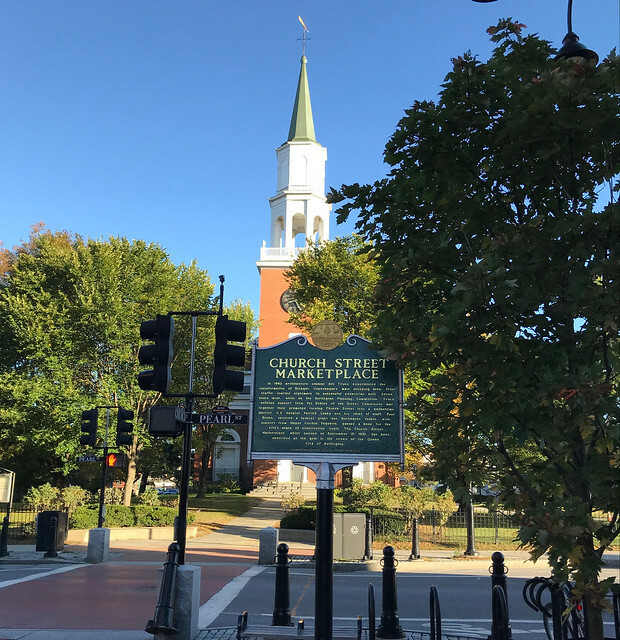 This marker is located at 36-2 Church Street, Burlington, Vermont. The GPS coordinates for this location are 44° 28' 49.4" N 73° 12' 45.7" W.
n 1962 architecture student Bill Truex experienced the transformation of Stroget, Copenhagen's main shopping area, from traffic-snarled nightmare to successful pedestrian mall. 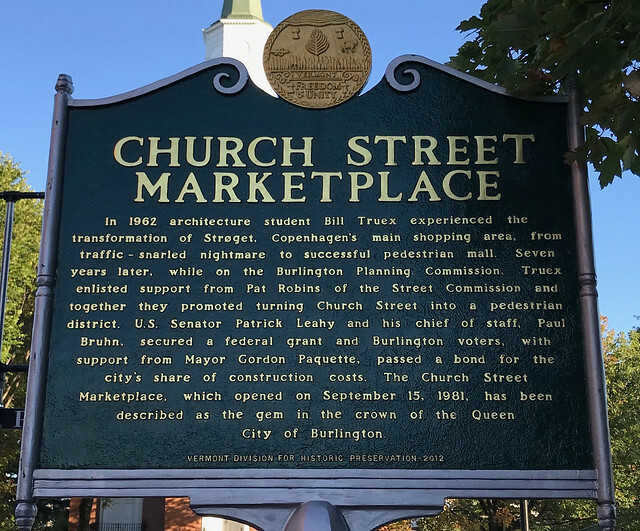 Seven years later, while on the Burlington Planning Commission, Truex enlisted support from Pat Robins of the Street Commission and together they promoted turning Church Street into a pedestrian district. U.S. Senator Patrick Leahy and his chief of staff, Paul Bruhn, secured a federal grant and Burlington voters, with support from Mayor Gordon Paquette, passed a bond for the city's share of construction costs. The Church Street Marketplace, which opened on September 15, 1981, has been described as the gem in the crown of the Queen City of Burlington.